We’d love your help. Let us know what’s wrong with this preview of Spartacus III by Robert Southworth. Empires clash as they hunt for a fabled blade. Spartacus and his friends fight for survival, amidst men who will stop at nothing to hold the legendary weapon. Danger threatens from the shadows, as old and new enemies emerge with violent intent. Spartacus and those he loves will stand together and even the Gods are undecided upon their fate. To ask other readers questions about Spartacus III, please sign up. As part of my holiday reading I finished Robert Southworth's Spartacus trilogy with The Pharaoh's Blade. It follows straight on from volume II in terms of action; there is no time for our heroes to draw breath. Once again they are pressed into service - made an offer they couldn't refuse - for somebody they really don't trust. This time they can at least enjoy the company of wives and children, though there is the nagging sense that these may well be also serving as hostages. Whatever the narrat As part of my holiday reading I finished Robert Southworth's Spartacus trilogy with The Pharaoh's Blade. It follows straight on from volume II in terms of action; there is no time for our heroes to draw breath. Once again they are pressed into service - made an offer they couldn't refuse - for somebody they really don't trust. This time they can at least enjoy the company of wives and children, though there is the nagging sense that these may well be also serving as hostages. Whatever the narrative reason, it does at least give us a view of the female participants in what has been at times a male-dominated world. The blade of the title is more of a relic or symbol than a real weapon, but it looks likely to become a pawn in the endless power play between Roman factions. Spartacus and crew are tasked with preventing its misuse, and to do this they need to defeat hostile factions. The quest, as you would expect, brings out the best and worst in different people. Interestingly, Spartacus himself has to relearn the skills of leading an army - just as he formerly led the slave rebellion - rather than simply fight as a gladiator. It's not a role he wants to take on, but it is a necessary one. It's an absorbing tale, taking the reader from one far-flung and restive end of the Roman Empire to the other. I found it a satisfying conclusion to the trilogy. It feels as though at some stage during these books we have been introduced to almost every people group in the Empire, with all their differences of culture and attitude. So this is Rob's third and final Spartacus story and wow, what a great way to end it. The story starts well with the back story into a legendary dagger, it is quickly shown to us that this dagger is not one you want falling into the hands of the wrong person. so much so Thutmose who currently holds the dagger send it away from his land as he knows the in wrong hands it could caused disaster. Fast forward a bit and now we find ourselves back with our hero Spartacus along with his friends Cassian an So this is Rob's third and final Spartacus story and wow, what a great way to end it. I really don't want to give too much away as I think you should read the story for yourself and I hope like myself you won't be disappointed with how the book ends. I knew Rob wouldn't be able to keep this series going forever but I really do think he tied the series up nicely. Rest assured if you've read the pervious two books you will love this. Keep the books coming Rob! Awesome conclusion to series. 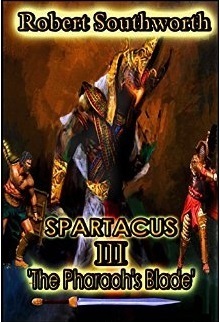 If you're a fan of Spartacus or just historical fiction in general the series is a must read. Wonderful end to a great series.